Notice! Sealife Family Resort Hotel does not accept reservations at this time. Please try again later. 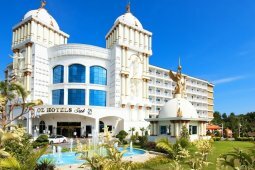 Sealife Family Resort Hotel Contact. Sea Life Family Resort Hotel is located in Konyaaltı Mevkii of Antalya and is located on the seafront, giving its guests a privileged holiday with its private beach area. Sun beds, umbrellas and towels are left free for guests' use. The spacious rooms are designed with a modern understanding of the facility; air conditioning, minibar, LCD TV, satellite broadcasting, balcony and safe. Free parking (limited capacity), 24-hour reception, lobby and luggage storage are among the other facilities of the facility. The sauna, the hammam, the steam room and the massage treatments in the spa and health center offer guests the opportunity to refresh both physically and mentally. In the morning breakfast, lunch and dinner are served as open buffet. With breakfast the guests are making a nice start to the sun. At lunch and dinner, Turkish and international cuisines are prepared by master chefs. The outdoor swimming pool, which is regularly maintained and equipped with sun loungers, allows guests to cool off during hot summer days. The facility is equipped with a large number of important meetings and conferences. Sea Life Family Resort Hotel is located 20 km from Antalya Airport. Groups : No information is given for the group guests at the Sea Life Family Resort Hotel. Cancellation/ prepayment : No cancellation and refund options are specified. Sealife Family Resort Hotel accepts VISA and reserves the right to temporarily hold an amount prior to arrival. Sealife Family Resort Hotel accepts Master Card and reserves the right to temporarily hold an amount prior to arrival. Sealife Family Resort Hotel accepts Maestro and reserves the right to temporarily hold an amount prior to arrival. Sealife Family Resort Hotel accepts Bank card and reserves the right to temporarily hold an amount prior to arrival. Sealife Family Resort Hotel accepts ATM card and reserves the right to temporarily hold an amount prior to arrival. The resort offers All Inclusive service between 10:00 - 24:00 hours. Italian Cuisine Minimum 7 Nights Available 1 time during stay. Mexican Food Minimum 7 Nights Available 1 time during stay. - A la carte restaurants, beach, snack bar, aquapark and animation are available from 01.05 to 15.10. Wireless internet (Wi-Fi) is free in the lobby and in the rooms. Tesiste disco entry is free. All beverages to be taken from the disc are for a fee. - Couples who want to use the honeymoon package of the resort must show their marriage certificates at check-in for the accommodation they will make within one month from the marriage date. - The entrance to Sea Life Family Resort Hotel rooms starts at 14:00. The departure time from the rooms is no later than 12.00. Tesise pet is not accepted. The use of outdoor open spaces is subject to seasonal conditions. - Apart from family rooms 2 + 2 and 3 + 1 accommodation is not accepted. - All-inclusive accommodation starts with lunch, includes dinner until the number of nights you have stayed, and ends on the morning of departure with breakfast. - In case the accommodation room is a special type of rooms such as a family room, a suite room (and so on), the fee is not made in case of early departure from the hotel. This is the worst place you can spend your money! The entertainment team will make you feel embarrassed in front of all guest and make fun of you as much as they can, because they are not professionals they are clowns trying to find ways to make clients laugh. They never answer to complaints and they treat you with disrespect. The drinks at the hotel are the poorest you can find, all made from concentrate and taste like plastic. They will charge you if you ask for a natural orange juice, but they serve oranges everywhere. Alcohol it’s everywhere but very bad quality! Great value for the money but don't expect something too fancy. For the basic vacation it was great. Beutiful hotel had all inclusive food n drinks all the time enjoyed our stay. Staff very friendly highly recommended.